June 10, 2016 – The Space Sciences Laboratory at the University of California, Berkeley, reports that the MAVEN spacecraft is in the midst of its latest deep-dip campaign. 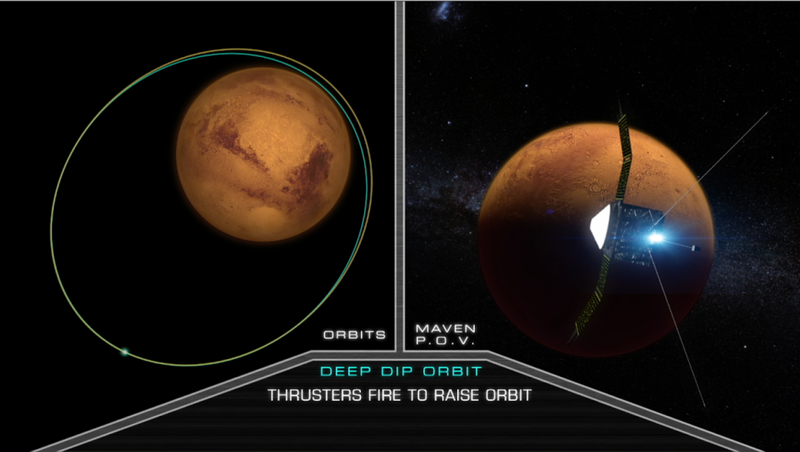 This is the final deep-dip campaign of five planned for the mission. Three maneuvers were successfully carried out to lower the periapsis (or lowest) altitude of the spacecraft by approximately 29 km, placing MAVEN into the targeted density corridor, where the average density of Mars’ atmosphere is 3.0 kg/km³. During normal science mapping, MAVEN makes measurements between an altitude of 150 km and 6,200 km above the surface. During deep dip campaigns, the spacecraft’s lowest altitude in orbit (periapsis) is lowered to provide additional data. At 119 km, MAVEN reaches the Martian homopause, which is the lower, well-mixed region of Mars’ upper atmosphere, where the density is about thirty times greater than at periapsis during a typical science orbit. The fifth deep dip for MAVEN is uniquely located over the solar terminator (the boundary between dayside and nightside), close to the ecliptic plane, and at a Martian latitude of 35ºN. The three maneuvers—carried out on June 7 and 8 required a total ∆V of 4.6 m/s and resulted in a periapsis altitude of ~119 km (74 miles). Each of the five deep-dip campaigns lasts five days. The first three days of the campaign are used to lower the periapsis, by gently firing the rocket motors to “walk” the spacecraft to its lower orbit. The remaining two days allow the spacecraft to collect data for roughly 20 orbits. Since the planet rotates under the spacecraft, the 20 orbits allow sampling of different longitudes spaced around the planet, providing close to global coverage. At the end of the campaign, two maneuvers are conducted to return MAVEN to normal science operation altitudes.